but it still makes a mighty big sound." No opening act. Buckingham didn’t even bring a band. Yet it would be understandable if members of the sold-out crowd might have needed an occasional reminder that the Fleetwood Mac star was working alone. It seemed incredible that one person could deliver such an array of sounds. Buckingham and his arsenal of a dozen or so guitars, with subtle help from a few effects pedals, offered an impressive overview of his long career with Fleetwood Mac and as a solo performer. 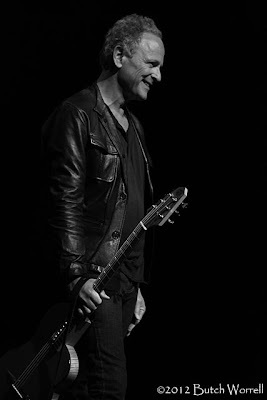 Check out the 14 fabulous Black and White shots of Lindsey from his show in Franklin, TN just outside of Nashville on July 27th.